"Dismemberment"? Yeah, nothing extremist about that. I don't know if you know how abortion works. I don't think he knows much about anything. 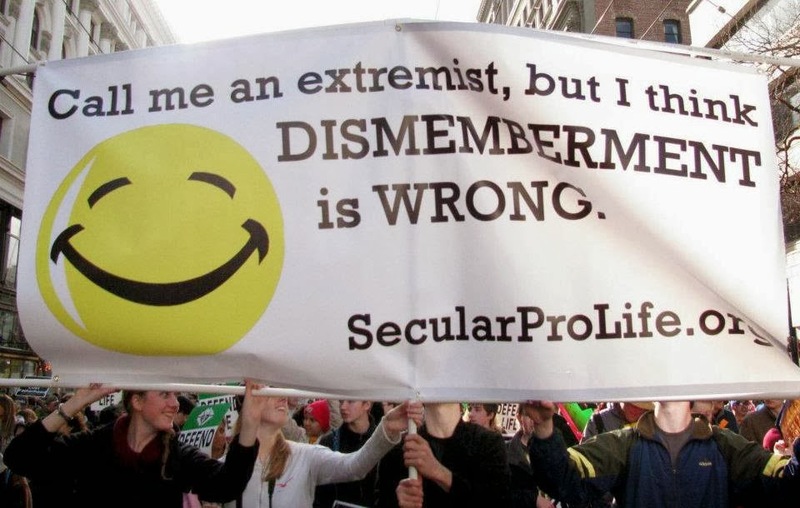 If there is no dismemberment (say, using the morning after pill, or any medication abortion--up to 9 weeks, I think), is it not wrong? Are all abortions, the majority, done by dismembering the embryo/fetus? And does it matter how it's removed? Would it be acceptable if every embryo was removed through c-section? Most involve body parts being removed individually. No, it's still wrong. Banners and signs (and bumper stickers) are not meant to be comprehensive arguments against abortion. I think that is not true (although I don't have time to do the research now). Do you have any evidence for this? Well, when you're vacuuming up a child, body parts are ripped off. Sorry guys, but the method used to abort doesn't change the status, morally or legally, of what is aborted. Dismemberment is a Fallacy, an Appeal to Emotion.